Clients often ask us to help them find a patent broker. Unfortunately, unlike real estate brokers, you cannot simply look up patent broker reviews on Yelp. With new brokers entering the market, old ones leaving, and little market transparency, it can be difficult to pick a patent broker. And this is a problem because some brokers have much higher sales rates than others. The brokers in the green circle bring about ten deals to market each year and have a sales rate much higher than the market (for this data set, 20% of the packages had sold). 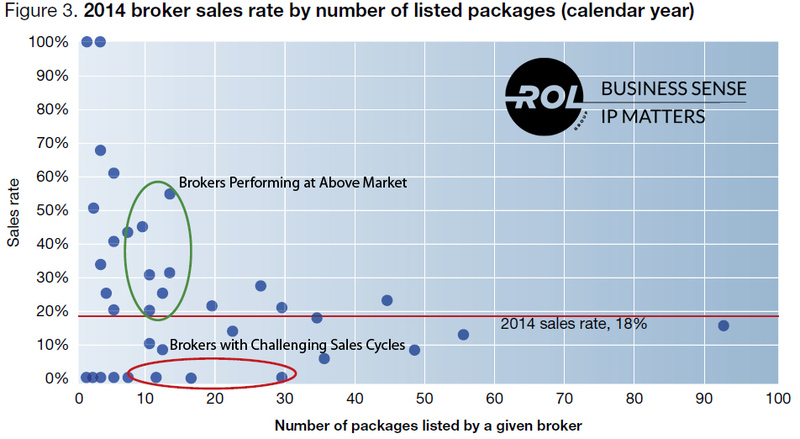 Brokers in the red circle are challenged with lower sales rates. You want to pick brokers in the green circle. Looking at Figure 3 of our latest paper on the patent market, each dot represents a patent broker. The y-axis is the sales rates for that broker. The x-axis is the number of patent packages brought to market by that broker. The brokers in the green circle bring about ten deals to market each year and have a sales rate much higher than the market (for this data set, 20% of the packages had sold). Brokers in the red circle are challenged with lower sales rates. You want to pick brokers above the red line and may want to consider picking brokers in the green circle. Here are ten best practices for choosing a patent broker. How well does the broker understand the market for your patents? Who is buying? 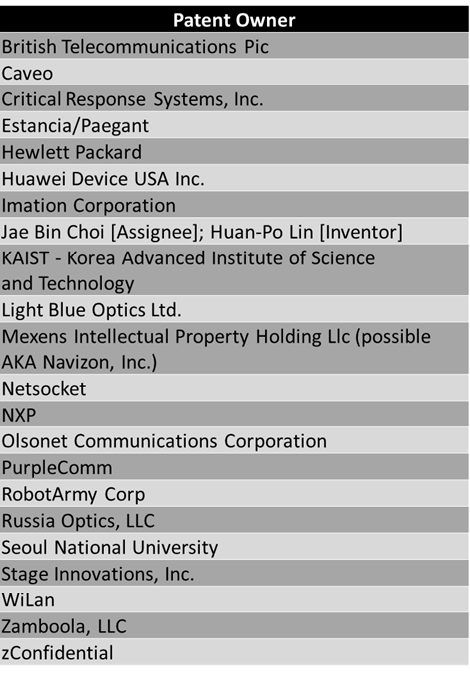 What kinds of patents sell? Is your technology hot now? What are their rates? Ask them what they charge and how. What kinds of issues are likely to come up in diligence? Do you like the person? You will be on many calls with them. They will be representing you and your patents. Ask the brokers if there are engagement terms that surprise sellers. What is their track record? How many packages do they bring to market each year? How many do they sell? 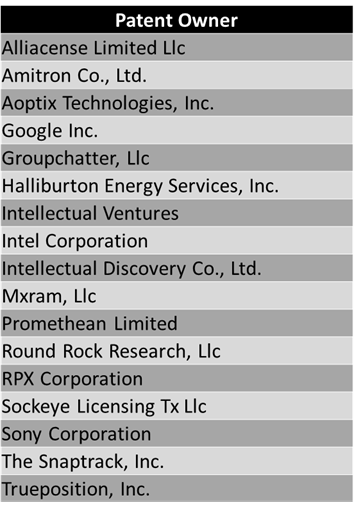 You can find a list of patent brokers on our website. Ask the brokers for 1-3 example sales packages they have brought to market. Review them and think about how you would react to the package if you were buying patents. Helps package and sell your patents. Help guide buyers and sellers on pricing. Coordinate any bidding. Communicate with you about the status of your deal. Help you understand requests from buyers. Ensure that communications from the brokers meet your standards. The broker is positioning the portfolio the way you want. You are receiving regular updates. Decide whether you will accept the offer. Negotiate the purchase agreement. The brokers can help here, but they are not your attorneys. What pricing estimates are the brokers giving you? How long will it take to sell your patents? How is commission calculated? Does the broker make more money if they get you more money (a good idea)? What happens to the broker’s costs? Are there caps on costs? What is the tail? How long will it be in place? The tail is the length of time after the representation ends in which the broker would still receive some commission. What rights might you have to waive? Damages, notice? Here are some factors that tend to drive value in patents; ask the brokers their thoughts. Claim charts or evidence of use – is someone infringing today and can you show it? Age – buyers tend to focus on older patents (at least eight years from priority) that have about five to ten years of life remaining. 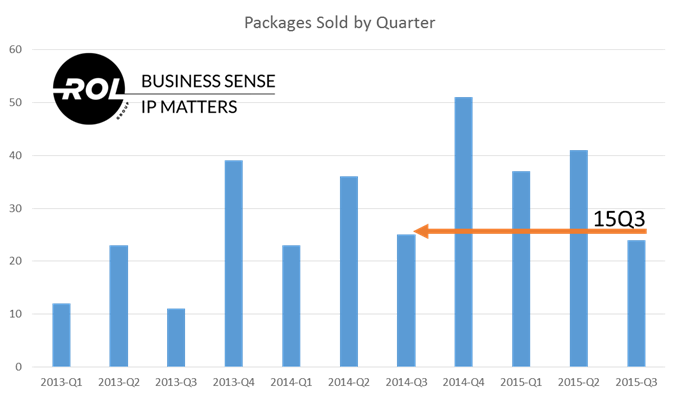 Open continuations – is there an open continuation on the key patent(s) in the package? Which technology areas that are hot. Although there is not a lot that has been written about the patent market, there are people to follow it and talk about it. We write an annual paper on the patent market; there are industry events where patent markets are discussed. Pricing, time to sell, who buys, and who sell are pretty well understood and there are free reports on this information. Spend half a day reading up on the topic, then set your expectations based upon that data. This seems counterintuitive. You are the patent owner, should not the broker be selling their skills to you. Yes, that is true, but it is also true that the best brokers can be picky. The best brokers have sales rates twice the market rate. Spending time to present your portfolio, the market opportunity and your background will help you get the best brokers to work with you. Some brokers are asking for upfront fees to cover some of their costs. Upfront fees are usually in the $5-15K range for smaller portfolios. However, upfront fees are not your only costs. Your patents are slowly expiring, your time and reputation matter, and you could be going with someone else. These are all costs to you.